I am absolutely passionate about public speaking. I love the energy and feedback from the audience when I get to present. As I mentioned in a previous post, improv is a big reason why I love the stage — it's my happy place. The challenge for speakers is to find the next event. I struggle with this, too, but I have found social media to help in a great way. I have noticed that while many keynote speakers excel on stage in front of an audience, they miss opportunities to use social media to market themselves. Speakers often don't have the time, resources or know-how to use social media and inbound marketing to promote their speaking. Professional speakers need a solid online platform to point their audiences to, to promote their products and services and to share and find future speaking engagements. 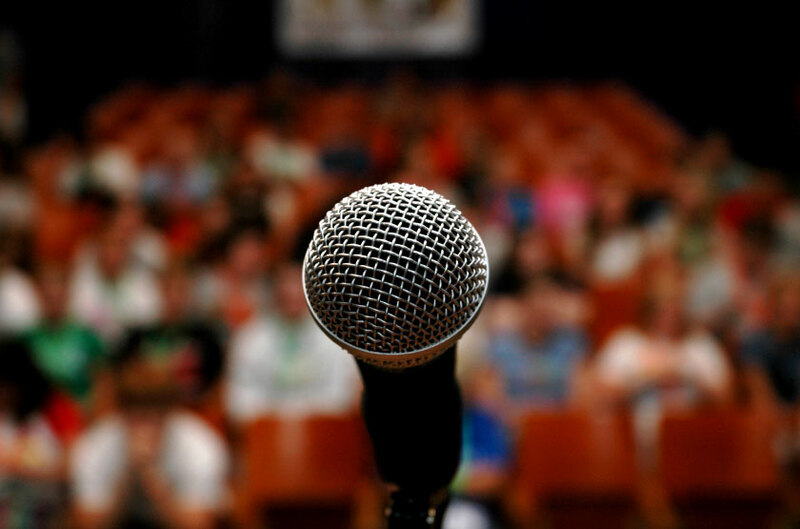 Social media and email marketing connects savvy speakers directly with their audiences long after their presentation has closed. Are you a speaker? CLICK THIS. I recently sent a brief, unscientific survey to members of the National Speakers Association for their collective thoughts on how they use social media. The results revealed 78% use Facebook, 76% use Twitter, and 72% use YouTube. Interestingly, most feel unsatisfied with the results. I was also surprised to learn that only 72% use email marketing. In my opinion, email is the most important method because you own the list, unlike social networks that can flick a switch and suddenly lock you out. The respondents from my survey shared their frustrations with using social media. The following are their main concerns and a few solutions that will help. Use Bufferapp.com to add a button in your browser, so you can quickly schedule any interesting articles online (including your own). You can also share your latest blog posts this way. Use Twitter Advanced Search to search for terms like "call for speakers," and save the results. You can add a column with these results in Hootsuite or Tweetdeck to refer to frequently. Creating a Facebook ad? Use your email newsletter subscriber list to create a Custom Audience. You can target your ad directly to the people you want to reach. Instead of just Boosting a post on Facebook, target it specifically to a segment of people you want to reach. Be sure to include Facebook's tracking pixel on your site, so you can measure conversions. "Too much noise and clutter." Create Twitter and Facebook lists of people you want to stay in touch with. This helps you cut through the clutter. Use LinkedIn and Facebook Groups to keep in touch with peers. Dealing with the pace of change is never easy. Social networks and related tools and services seem to change all the time. To stay on top of change, I recommend subscribing to sites like SocialMediaExaminer.com and Forbes.com/social-media. Futureforth has recently started working with public speakers to help them with social media and inbound marketing. You can learn more at inboundspeakers.com. Thank you to the following speakers for providing their insight: Linda Murray Bullard, John Morgan, Jason Luntz, John Haydon, Nicky Adinor, Richard Stiennon, Tod Maffin, Christopher Byrne, Jacqueline Wolven, Bill Cates, Brian Walter, Shep Hyken, Mark Davis, Monica Wofford, Scott Schwertly, Jan Freitag, Hugh Culver, and Dorie Clark. This has been an incredible year of speaking at conferences, companies and events. I'm truly blessed to have the opportunities to share my stories, tips and techniques with audiences. Surrounded by friends and peers who I admire, I began the year speaking at New Media Expo in Las Vegas. I provided the keynote presentation for the VMUG Conference in Nashville and Boston. I got to present in Saskatoon, Saskatchewan at the MoSo Music and Social Conference where I made new friends and heard tons of amazing music. I recently returned from the Limitless Business Day Conference in St. John's, Newfoundland, a beautiful place everyone needs to visit. A major highlight of the year was my keynote presentation to nearly 1,300 students at the American Marketing Association's Youth Collegiate Conference in New Orleans. I was the Nashville Technology Council and LinkedIn's keynote speaker at the LinkedIn Live Conference. My speaking travels even took me to Birmingham, Alabama, where I was snowed in! The freak blizzard resulted in my missing my chance to meet Neil Young (it's a long story), but I had a great time getting to know the attendees better. I absolutely love to present to different audiences. Whether it's a corporate training session or an auditorium with over a thousand people, I thrive on this. It took me years to realize how much I enjoy public speaking, but I suppose I should have known because of my background. Many people don't know that I am a Second City (Toronto) graduate. When I lived in Ireland, I had an improv comedy troupe. We performed improv shows each week in Galway, which always had our audience in stitches. It's this experience that brings my quirky sense of humor to the forefront when I present. If nobody laughs, I get nervous, luckily they always laugh (sometimes even with me). Most conferences hire me to be their keynote speaker to get the audience pumped up and ready to make the most of their time attending. My main presentation is called New Business Networking (the same as my book and podcast). By teaching the attendees (organizers and sponsors) how to network effectively, they have a better time at the conference and this results in new business, partnerships, hires and friendships. If attendees have a great time and find value in your conference they will return next year and bring their friends. Who doesn't want their conference to grow, right? Next year is just about here, 2015 is right around the corner. Let's talk about how I will make your conference a massive success by arming your attendees with everything they need to get the most bang for their buck. Whether it's how to be social using social media to build relationships, or how to listen effectively to remember names and faces, there's plenty in my presentations for everyone (even Neil Young). Pick up the phone and call me at 615-823-1608 today or email me dave@daveAdelaney.com. Let's get the ball rolling and make 2015 amazing together. If you would like to read recommendations, see a short video and learn about my other presentations please visit my speaking page.